China has a long tradition of folk song research and a rich storage of folk songs. 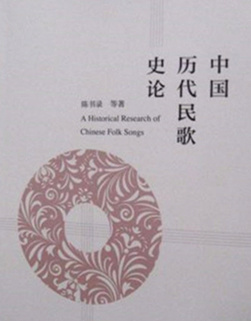 Chen Shulu’s A Historical Research of Chinese Folk Songs has helped preserve the fine tradition of Chinese folk song research and systematically examines related literature in an effort to establish academic norms for the research of Chinese folk songs. The book divides Chinese folk songs into different stages of development, such as creation, expansion, evolution, peak, integration, revival and reflection, exploring the evolution trajectory and characteristics of different periods. The song tange marked the beginning of Chinese folk song creation, leading to the flourish of pre-Qin Dynasty folk songs laid the foundation for the development of the Chinese folk songs and offered countless methods for later generations. The Yuefu folk songs of the Han, Wei, Jin and Southern and Northern dynasties come from the expansion period in the development of Chinese folk songs. Yuefu was a government office established in the Han Dynasty for collecting folk songs and ballads. Amid the unprecedented expansion of Yuefu institutions, Han Dynasty Yuefu folk songs expanded their content and artistry. The Southern Dynasties folk songs are the vital forces for the formation of “New Style Poems,” which were part of the transitional poetic style linking archaic poetry to the classical style of the Tang Dynasty. In the Sui, Tang and Five Dynasties periods, as well as the Song, Jin and Yuan dynasties, Chinese folk songs went through a period of evolution in poetic styles. The Ming Dynasty folk songs were another peak of Chinese folk song creation throughout history, following the Book of Songs in the pre-Qin period and the Yuefu folk songs in the Han and Wei dynasties, which were comparable to the Tang Dynasty poetry, Song Dynasty verse and Yuan Dynasty operas. The Qing Dynasty and Republic of China period witnessed the integration of folk songs into traditional Chinese society. The scale of folk song creation was more ambitious and the tunes became more diverse. Modern and contemporary folk song creation brought about a new wave of folk song creation and became the reflection period of Chinese folk songs. The new folk song movement was a leap forward in folk art in the context of the “Great Leap Forward” from 1958 to 1960. To some extent, it demonstrated the sentiments and ideals of the people, which yielded positive effects as well as many historical lessons. The book examines folk songs from many angles, including the merchants, religions, folk customs, affection and relationships, novels, operas, regional culture, and communication. For instance, Chinese folk songs throughout history described elements of the colorful world of merchants. Wuge, of the Southern Dynasty, contained a strong commercial atmosphere. The marriage of folk songs and the spirit of merchants formed a new landscape in the Ming and Qing literary world, presenting a cultural spirit that pursued individual freedom, opposed feudal rites and the idea of “emphasizing agriculture and restraining commerce.” Also, in contrast to poetry, fiction and opera, folk songs have their own special form of communication—the song field—a fresh, original and lively form for the spread of literature.